Finding the right bridesmaid gifts for your bridal party can be a difficult task on top of the already stressful job of planning a wedding. Luckily, we have the selection and customization of gifts you’ve been looking for! Our custom engraved wedding gifts are the perfect touch to any wedding day, with items ranging from barware to home décor and ready to be customized with your monogram or special message. No matter what type of things your bridesmaids are into, we have the ideal items to make them feel special when they open your gifts. Personalized wine glasses add a nice touch to a bachelorette party, custom picture frames will hold memories for years to come and monogram acrylic jewelry can be the finishing touch for a bridesmaid dress. Creating the perfect custom engraved wedding gifts is easy with our help! 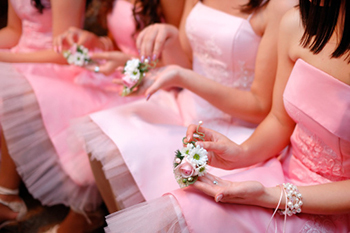 Bridesmaid gifts can be a fun shopping adventure instead of a time consuming job. Whether you choose to buy all of your bridesmaids the same gift or find something special for each one personally, we have everything you need to make the shopping fun and exciting. Kitchen tools to drinkware, pet supplies, earrings and more - you can find exactly what you need to tailor your bridesmaid gifts to each woman in your bridal party! Let Frederick Engraving help with this important part of your wedding planning. Our selection of personalized gifts and fast turnaround time will surpass any mall location for engraving. Start shopping today and discover all the great items you can get for your bridal party that they will use and treasure for years to come!